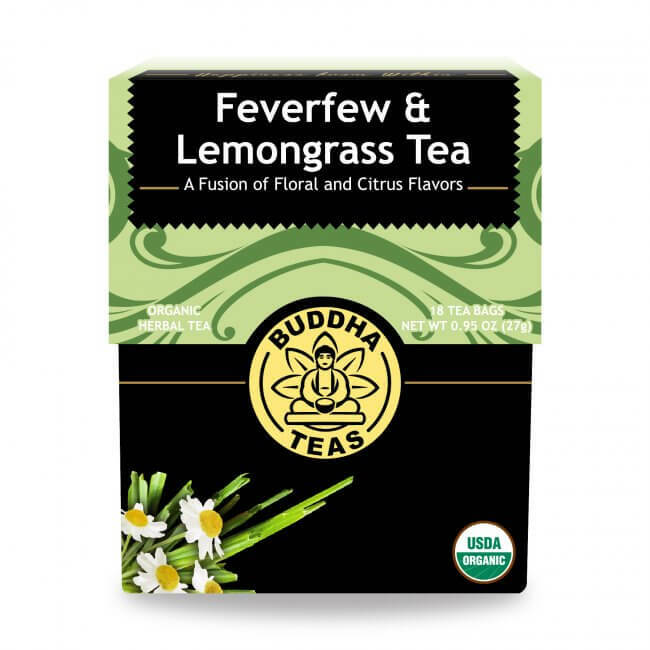 Feverfew & Lemongrass Tea brings together two well known herbs to provide a brew of complementary flavors that is delightfully citrusy and refreshing. A flowering plant in the daisy family Asteraceae, tanacetum parthenium, or feverfew, is a traditional medicinal herb most commonly prescribed for migraines. Native to Eurasia, Feverfew is now also found all over Europe, North America, and Chile. A sun-loving perennial herb, Feverfew is a hardy plant that can become quite invasive. Lemongrass, or cymbopogon, is a tropical island plant in the grass family, and is best known as a culinary herb incorporated into Asian cooking. With a gentle citrus flavor, its distinct taste adds a delightful essence to soups, curries, and, not as often, tea. This carefully balanced blend harmonizes the flavor of these two herbs to produce an aromatic herbal blend with a hint of delicious citrus flavor. 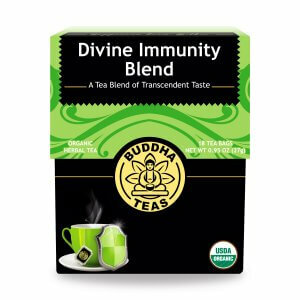 Blending these two flavorful herbs together creates a dynamic herbal brew that is more than just tasty – it’s also packed with nutrients. 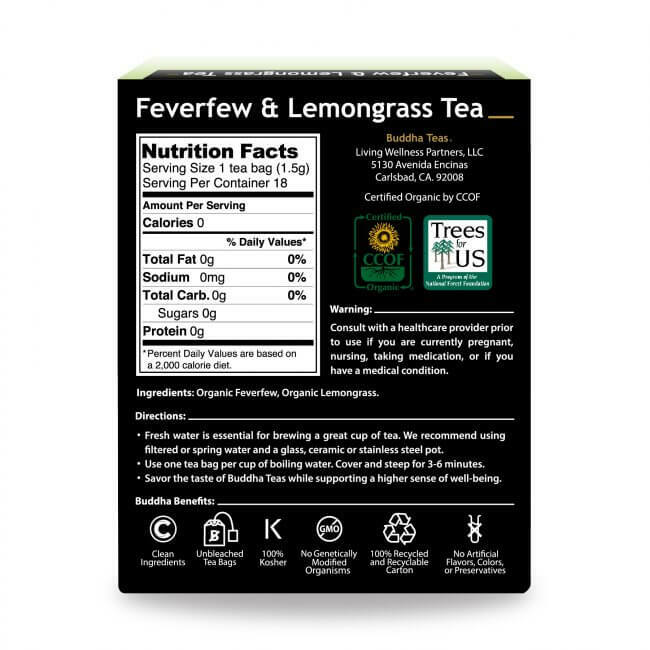 A single cup of feverfew & lemongrass tea offers vitamin A, vitamin C, and five different B vitamins, as well as minerals like calcium, phosphorus, iron, manganese, selenium and zinc. Combined, these two quality ingredients also provide protein, essential oil, tannins, saponins, and quercetin. 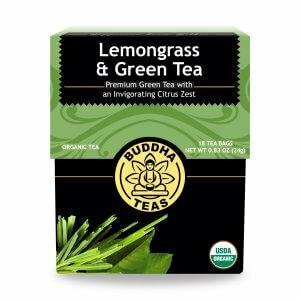 Sample a taste of this herbal brew for yourself and discover the wonderful qualities it can provide. For those that drink herbal teas, they’ll know that some of the best brews will come at the cost of a bitter taste. Our feverfew and lemongrass blend is carefully crafted to quell the bitterness that can come from feverfew. A bit of sugar, honey, or lemon can also help to doctor up the flavor of this brew. 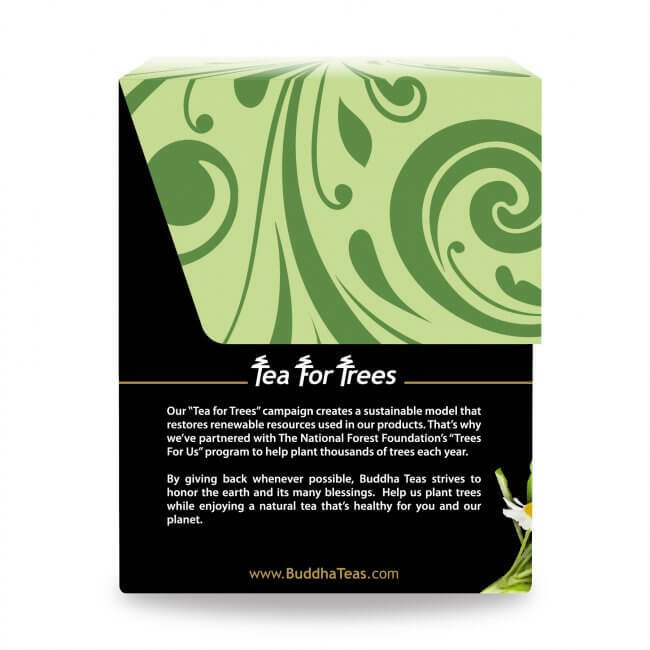 Buddha Teas offers fresh high quality herbs at the best available prices. Our customers are important to us, this is why we consistently present great deals like FREE shipping on all orders that are $50 or more and good deals for bulk orders, as well as our great coupon codes which can help you save even more money! Review Title: It’s so good!! My family and I are in love with this tea. 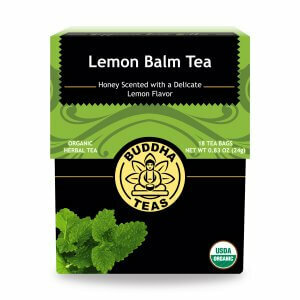 My mother said it’s amazing and she adds more lemon juice into the tea when it’s hot. While she loves to drink it like that, I’ve been drinking the tea straight up without adding anything else to it. I would recommend this product. Feverfew is part of my regimen for preventing migraine. 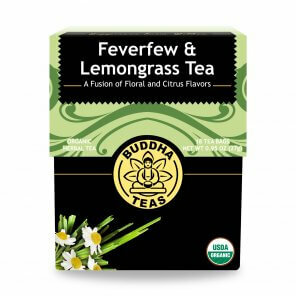 This blend with the lemongrass tastes so much better than plain feverfew, so I don't mind drinking it every day. I also really like the packaging design, which isn't something I would usually comment on, but the box sits on my countertop all the time and I actually don't mind seeing it. Details matter! Great taste and it helps decrease my migraines. Review Title: Good Tasting - Hope it Stops the Headaches! I love the flavor - very good, very soothing, very pure. My neurologist suggested this tea to help me, and I am glad it is a pleasurable experience. Thank you Buddha Teas! Awesome Tea...Take my words for it. This company are legit and have best teas out there, I'm a Tea freak and I purchased over 9 boxes (different type of teas) they all are great. 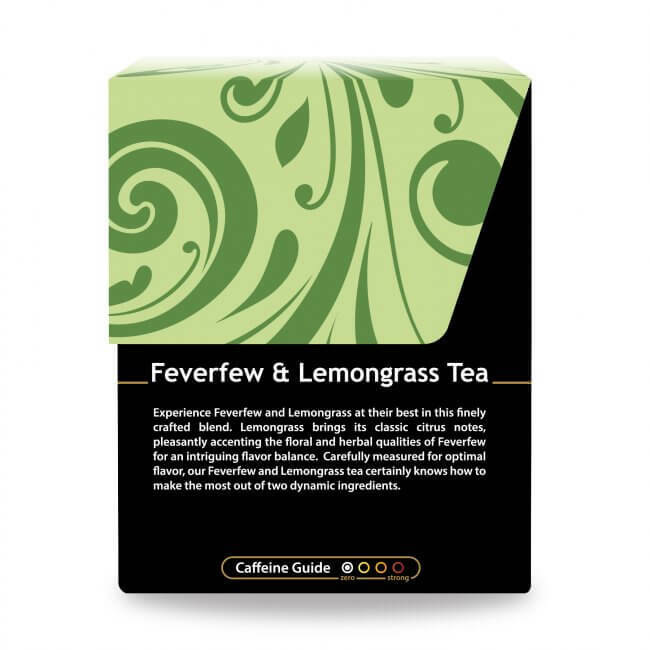 Feverfew and Lemongrass Tea has a great taste, My wifey loves it. I love this tea honestly so much. I have a condition where the muscles of my lower back are very weak. I notice on days I have this tea, that I'm no where near as tense/sore. I also really just love the taste. It's earthy and natural, but very smooth. I was having headaches almost every day for 2 months. I drink at least 3 cups a day and haven't had a headache since and it's been for 2 weeks. Super happy! This is solid tea in terms of effects for treatment. Upon opening and consuming the bag contents (which I know is not part of the directions, but hey, free undigestable starches for the probiotics i'm also taking), I noticed some grit and dirt. Like others I'm using this to help at the advice of my doctor. I have only been drinking it for a week so I don't know yet if it works. I was worried it might not taste good, but it's pleasant tasting without adding any sweeteners. I've even cut down on caffeine by drinking this in place of black tea. Shipping was very reasonable and fast.